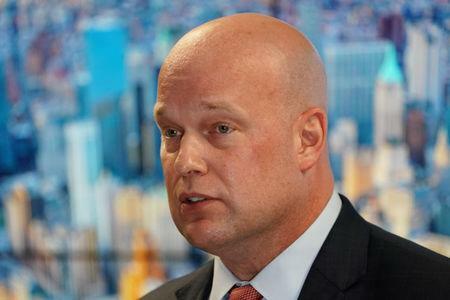 WASHINGTON (Reuters) - Acting U.S. Attorney General Matthew Whitaker was aware of fraud allegations against an invention promotion company where he was an advisor and was slow to respond to government investigators probing it, documents released on Friday show. World Patent Marketing was a fraud, one angry person wrote in September 2016. "What you don't know is how many people were scammed by him (Chief Executive Scott Cooper) and how fraudulent they are and how much money they robbed from people," wrote the person whose email was disclosed along with more than 300 pages of other materials released by the Federal Trade Commission. Democrats have complained for several reasons about President Donald Trump's appointment of Whitaker as acting attorney general after Jeff Sessions was forced out this month. "If true, this is extremely troubling and raises serious concerns about his fitness to serve as acting Attorney General and whether he was properly vetted for this critical position," he said in a statement. The hundreds of pages of documents released on Friday also show the FTC struggled to get in contact with Whitaker, who earned $9,375 for being on WPM's advisory board. In March 2017, FTC attorney Colleen Robbins emailed two colleagues to say Matt Whitaker "has not returned any of my calls." Later that month, one FTC lawyer emailed colleagues to say: "You're not going to believe this. ... Matt Whitaker is now chief of staff to the Attorney General of the United States." "I want to be very helpful," he said in the voicemail, which was also released on Friday. Whitaker subsequently spoke by telephone to FTC investigator James Evans on Oct. 24. Evans' notes from that telephone call show that Whitaker denied responding to "consumers," presumably clients of World Patent Marketing.